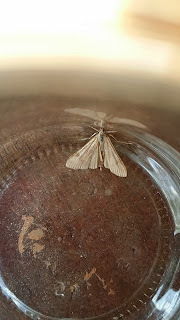 Carmarthenshire Moth and Butterfly Group: Help please? Can anyone help with ID for this one? Thanks. It looks like a horribly warm Rush Veneer (Nomophila noctuella) - the vanguard of a good migrant night perhaps. When did you find it? sorry - I meant horribly worn not horribly warm! Just fitted an actinic bulb in porch and this was on the wall (with a few other species) on Wed night (3 June). If you are not certain assume I should not list as it is very worn? Thanks for tip off last night. I didn't do as well as you or the others but best catch yet. Will blog later as I may need help with a pug and some egss which were laid in one the the egg boxes.